This all-in-one vent fan provides automatic, rain-free, high-flow ventilation. Equipped with a remote, you easily control the fan’s functions at your convenience. It can even be operated while you’re driving. 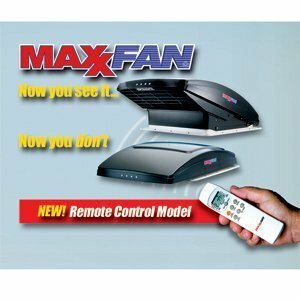 The Air Maxx fan comes with a flush-mounted keypad that’s easy to clean and maintain. From this keypad, you can control the fan speed, the thermostat, air intake, and the exhaust functions. This little RV vent packs a punch with its 10-speed fan. It can even be run with the vent closed, to help circulate interior air just like a ceiling fan does. The vent is opened and closed by rotating the knob and pushing it upward. This locks the vent securely in place. 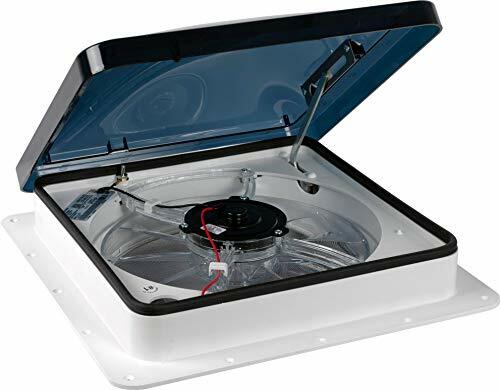 This system works in a standard 14-inch by 14-inch RV roof vent opening. Mounting screws and hardware are included with this RV vent, but you’ll want to check the roof seal after installation. This product comes with a 2-year limited warranty and a limited lifetime warranty on the vent lid. This 10-speed fan gives you all the convenience of a remote-operated vent without breaking the bank. The lid opening is operated electrically instead of manually. A rain sensor closes the lid automatically in the event of rain. Along with the remote control, additional controls are located at the ceiling. This powerful 12-volt fan works efficiently by pulling in the fresh air and moving out stale air. It can move up to 900 cubic feet of air per minute. When the lid is closed, this vent can be used to circulate the air in ceiling fan mode. This model fits in a standard 14-inch by 14-inch RV vent opening and the smoke lid closes for a low-profile look. This unit is easy to install and includes a removable interior insect screen that can be taken down for easy cleaning. 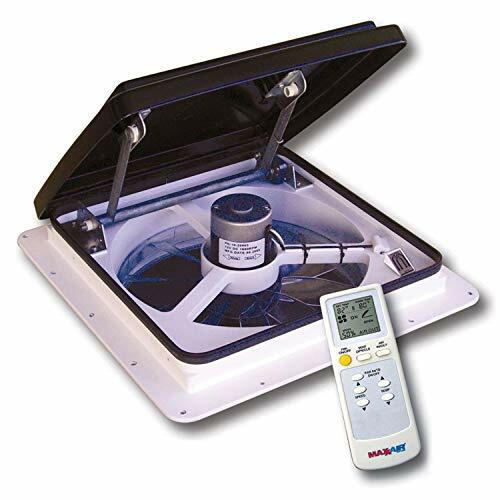 Mounting screws and all mounting hardware is included with this unit, but roof sealant must be purchased separately. This small and lightweight RV vent offers a 3-speed fan. Extremely quiet at all fan speeds, this efficient roof vent quickly moves old air out and brings in fresh airflow. The plastic exterior is thick and durable. The vent lid’s manual use means that it’s uncomplicated to use and there’s less risk of mechanical failure. It fits a standard 14-inch by 14-inch RV roof opening and sports a high-profile design. When not in use, this ceiling vent seals tightly to prevent any water from seeping in. This unit offers easy installation with just two wires to navigate. It can be installed in a matter of minutes and is suitable for use in most recreational vehicles. Mounting hardware is included with this RV vent. This vent fan can be used when your RV is not running, but it will draw significant energy from your battery. If you have access to solar energy, you may want to consider tapping your vent into those stores. Plan accordingly when looking at your cooling needs. While this vent cover doesn’t offer a fan, it does provide you with a cost-efficient and effective way to vent your RV. With this vent cover, you can have access to fresh air come rain or shine. Removable louvers mean it’s exceptionally easy to clean. An in-built insect screen gives you the fresh airflow you’re looking for without bringing in the bugs. This vent cover is made of UV-stabilized resin, is extremely durable, and comes in five different colors to match your aesthetic. Weighing in at just over 3 pounds, you’ll find this vent cover is easy to install. Mounting hardware is included and this unit will fit in any standard 14-inch by 14-inch ceiling opening. The aerodynamic shape will help keep your fuel costs where you want them. This cover can be used over the top of another fan. This is a useful feature if you’re looking for additional protection for your existing fan. 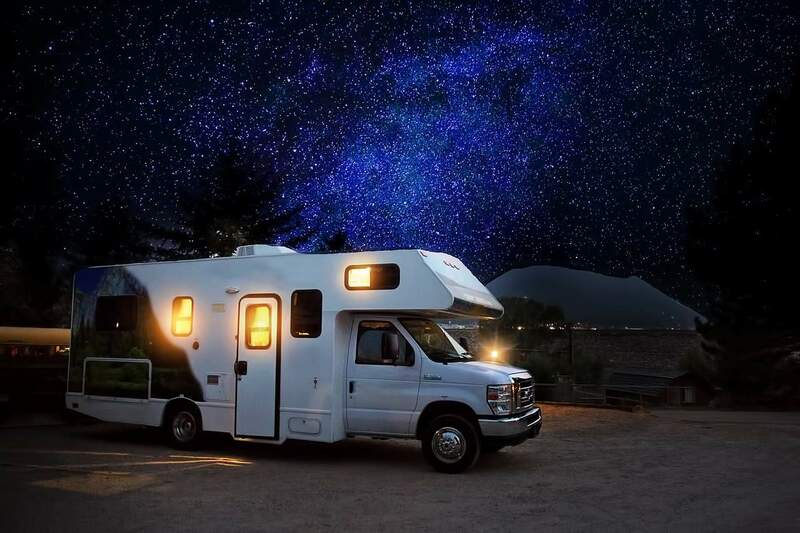 Even if you have an air conditioner in your RV, you may not want to use it all the time. An RV vent cover is one of the most important RV accessories. It can help you have the comfortable space you’re looking for without the cost of air conditioning. If you’re shopping for a new or replacement vent cover, here are a few things to keep in mind. If you’re shopping for a new vent cover, you’ll find many options. You can have fans with many speeds, fans with few speeds, or covers with no fans at all. From thermostats and remote controls to basic manual operation, you can customize your vent cover to your needs. Take a good look at what you want in a vent cover before you begin shopping. There are many options out there that suit a standard roof opening. However, the exterior component may vary in size. Do you want something large with a high profile? Are you looking for an aerodynamic design or something that doesn’t interrupt the visual roofline? Remember, any additional height added to your RV could complicate matters when it comes to clearing bridges, garages, or gas stations. Do you think you’ll be running your vent fan at night? Or will your vent cover be open continuously? This will allow outdoor noise to come in, or create noise for you and your campsite neighbors. If you plan to run your fan often or at night, you may want to invest in a quiet fan. Unless you plan to constantly monitor your vent and the weather, protecting your vent from rain is your best option. Many automatic or sensor-based products exist to help keep your vent and your RV safe from rain. Otherwise, you should consider covering your vent with an additional rain cover to help protect it. Once you’ve selected your roof vent cover, you’ll want to maintain it. This will keep it functioning well and extend its life. While it may be an easy item to overlook on your maintenance checklist, cleaning your vent cover is critical. Avoid collecting an excess of debris in the vent cover to keep the air flowing as it should. This will help avoid any jamming, overheating, and motor burnout. When you’re on your RV roof doing your annual roof maintenance, take a good look at the exterior of your vent cover. Has any of the plastic degraded? Are the screws all accounted for? Do you need to reseal? Staying on top of this will help prevent a loss while driving, which can be hazardous for you, and others on the road.